We have been working hard to better serve our customers over the last few months, and we have some BIG things coming in the next few months at Dynamic Interactive. We have just re-launched our website to make it even easier to get the service and support you need while presenting what we do in an easier to read format. We sincerely hope you like the new changes. At Dynamic Interactive we aren’t your typical corporation, we don’t mind showing our lighter side. Our customers are amazing and we have fun working with such great people on a daily basis. 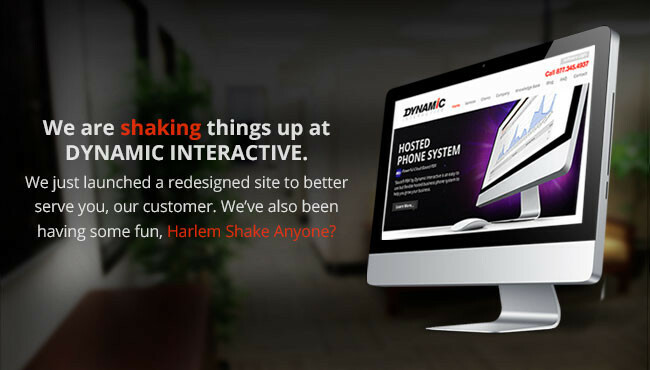 In typical viral fashion we have been swept by the ‘harlem shake’ dance and even our website is getting in on the fun. See for yourself. Once again thank you for your continued business, we at Dynamic Interactive strive to continue serving our customers. Our company was founded on the belief that we could help businesses succeed by offering telephony solutions that would make their life a little easier. That is exactly what we have done. The team at Dynamic Interactive have been steadily expanding our product base to include new solutions, innovative features, and reporting tools that are comprehensive and useful to our customers. With in house engineers we are able to customized solutions based on our clients needs. There is no need for an in the box solution when you can create and innovate to come up with the perfect solution. We don’t take ourselves too seriously because we are focused on taking care of our customers and having fun doing it. Our culture promotes innovation so that our clients get the absolute best that Dynamic Interactive and each team member has to offer. If you have an idea – let us know. If you thing we should improve something – tell us. We are here to listen.